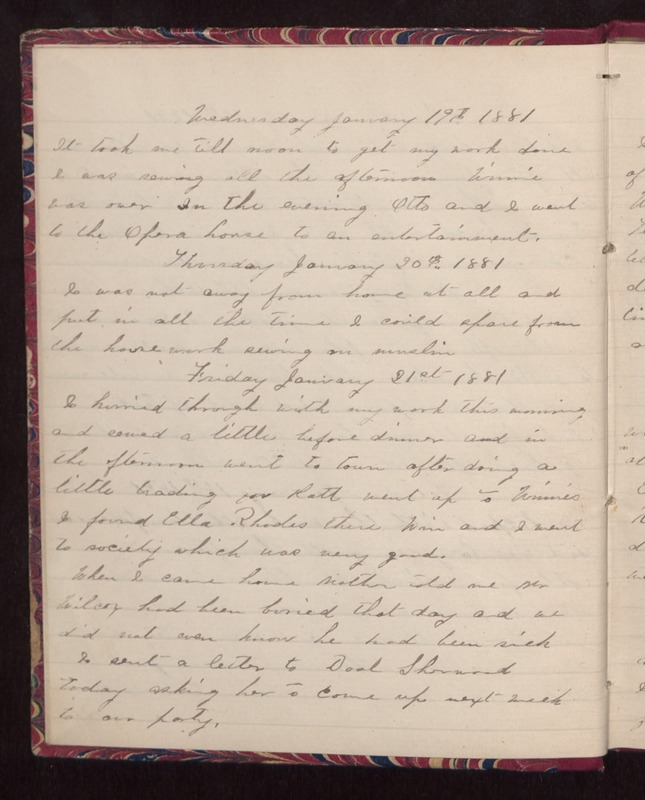 Wednesday January 19th 1881 It took me till noon to get my work done I was sewing all the afternoon Winnie was over In the evening Otto and I went to the Opera house to an entertainment. Thursday January 20th 1881 I was not away from home at all and put in all the time I could spare from the housework sewing on muslin. Friday January 21st 1881 I hurried through with my work this morning and sewed a little before dinner and in the afternoon went to town after doing a little trading for Hatt went up to Winnies I found Ella Rhodes there Win and I went to society which was very good. When I came home Mother told me Mr Wilcox had been buried that day and we did not even know he had been sick. I sent a letter to [Doal?] Sherwood today asking her to come up next week to our party.